Purchase James Bama Art Prints online from ArtBarbarians.com located in Minnesota. If you're one of those people who enjoy a great portrait, we have James Bama art prints for you. These special prints reflect a lifestyle that few of us have lived or would choose. These are portraits of rugged individuals which have a deep sense of the human factor that some kinds of wildlife art doesn't portray. Like most people you probably can identify with the look you see in these special people captured by the artist in a certain pose and moment in time. 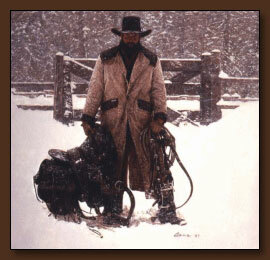 We have these examples of Western art featured on our web site here and you'll see a wide selection to choose from. We have a couple of examples of this artist's fine work. The one to the left is "Cowboy Anne" and the one below is "Buck Norris". Each has a distinctive look and draws you into these people and the West itself. 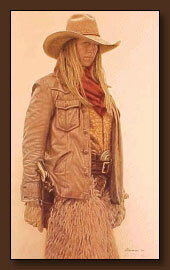 James Bama is simply one of the most highly acclaimed Western artists working today. James Bama's art prints portray the oldest living Crow Indian, a man who would be Buffalo Bill and all manner of men and women of the new West keeping the traditions of the old West alive. There is no mistaking a Bama painting. The exacting texture and detail he captures in his work sets him apart from his peers. Whether the texture is skin, stone, cloth or leather they are what is noticed first and foremost in all his art. Indeed, one look at the lines etched in the faces of the cowboys and Native Americans, for example, speaks volumes about the lives of the artist's subjects. James Bama saw his commercial success as a means to accomplish what he most wanted to do. "I wanted to (move to Wyoming and) trace the beginnings of Western history," Bama said. "To see the oldest weapons and saddles and be close to the culture." His second career was even more successful than the first, with his portraits of fascinating, real people of the new West maintaining and preserving their history and heritage, being seen in prominent galleries, collections and exhibitions across the country. Along with this genre of paintings, you may want to browse our wildlife prints and you'll find that our selection of paintings is one of the deepest on the Internet, with many artists listed here. We're adding new paintings and prints everyday, after that you may want to move onto our original paintings area which will give you an idea of the depth of the art we carry. It's exciting to be a part of an offering which brings people such a sense of satisfaction and joy. The colors, the depth, the natural settings, all of this makes this art we care about so special. We have many personal relationships with many of these artists that we exhibit and sell, and they trust us to portray their art in a correct manner. Those relationships give us the advantage of getting you some of the best new art first, so you can add to your collection before what you want is gone. Call us if you have any questions about anything you see on our web site or need to know more about James Bama art prints. We're happy to answer your questions personally regarding availability or something special you're looking for.